A coworker found a long, cigar-like object made from leaf bits inside a spa filter cover. Six months later 4 of these adult bees emerged. Phoenix, Arizona, USA. Nest found Oct. 2008. Bees hatched April 2009. Leaf-cutter Bees are very common in the Sonoran Desert, especially around the urban areas of Tucson, Scottsdale, Tempe, and Phoenix. Flowering landscape shrubs such as lantana produce nectar and pollen which these bees gather for their young. They cut circular and oblong segments from leaves (bougainvillea a favorite) and use them to construct cylindrical tubes, about the diameter of a pencil, divided into cells. Each cell is packed with a mixture of pollen and honey plus one egg. Within each cell the egg hatches, develops as a grub, and finally metamorphoses into an adult bee. 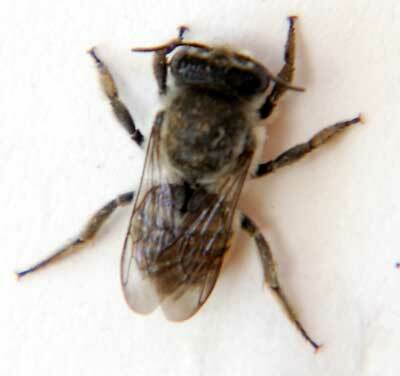 Thus the bees do not eat leaves and importantantly each bee is responsible for its own solitary nest. They rarely if ever sting people and are vital pollinators of vegetables and fruits in our gardens.